[By roving reporter Dawn Hawkins] Cycling home from the pub at the end of the day, through the calm, crisp midnight air, I was thinking “yeah - that was a cool idea – I’m glad I did that”. Twenty hours earlier, however, it was a different story: I’d woken at 4am realising “OMG, today is the day I’m signed up to go to London to do a 2k in the middle of the Olympic Velodrome watched by a load of people”. Doubts about my own sanity were still coursing through my head a couple of hours later when I joined a small band of rogue Chesterton rowers, taking the 6:15 to Kings Cross heading for the British Rowing Indoor Championships. The sun was only just rising over the East End as we sped from St Pancras to Stratford International and the Velodrome. Even so our support crew, the wonderful Angela armed with flag and flapjack, had managed to arrive in advance of us and stake out a Chesterton base in a perfect spot for watching both the red and the blue racing areas and for nipping to the bathroom to vent pre-race nerves. First up was Jonathan. He had been put with the lightweights so he went off to convince people that this was erroneous, which took just one look. We watched him ready himself for action in the warm up area, disappear underground and re-emerge on to the race floor to the “please welcome the athletes…” announcement to stirring music. As Jonathan erged to a 7:04 at a magnificently powerful 23 strokes per minute on the race floor, a little yellow boat, with his number on it, jostled for position with about 50 others on a massive screen behind him. A commentator ramped up the atmosphere. Then, suddenly, the image switched to live camera shots of individual ergers – the agony, the determination, the exhaustion. For a moment I forgot that was going to be me in a very short while but then it came back to me. Ugh. Although we were in different categories, Anne, Eleanor & I marshalled together which was great, not least because I got to witness the moment one of Anne’s competitors told her that she was going for a world record attempt. Waiting for our 2k races to be called, my mouth was getting pretty parched with nervous tension, not helped by the hot dry atmosphere in the heart of the Velodrome. Then things went more drastically off plan when our warm up was cut to 6 minutes, to make up time lost to some technical issue, and the ideal 10 minute warm-up Anne & I had perfected over the last 12 weeks of training went out the window. As we entered the race floor, the sight of the race marshals holding stacks of those grey cardboard sick bowls, usually reserved for medical institutions, did nothing to improve our nerves. Anne confessed to me later that she’d never suffered from such overwhelming butterflies and feeling of feebleness: About sums it up. Finally, I was seated on Erg number 12 in blue race area with the familiar Concept 2 little screen of hell in front of me. It had all the usual stats plus my name – my name on a Concept 2 monitor - oh dear! I thought about making a run for it but pulled myself together and managed a respectable 8:20 to come 6th in the masters 50-54 women while Anne clocked up a tidy 8:26 to come 4th in the masters 60-64 women. Slightly disappointing in terms of times but both happy to have made it through and got good placings. Attention was then on Eleanor, no PB for her either but nevertheless, she stormed to 3rd place in the womens 40-49 year old lightweights with an impressive 7:46. Anne & I sneaked into the medal presentation area and saw her getting a bronze medal up close. Next a short break from the Velodrome for a walk through the Olympic Park and lunch on Victory Parade. Then we watched the Open 2k finals with the men’s race including several GB rowers plus, accompanied by much media attention, Sir Bradley, looking like a 1970s petulant John McEnroe with his white head band and bushy hair: He even seemed to do a McEnroe a bit of a stomp off at the end when it didn't go to plan. Most inspiring of all, the para and adaptive athletes and a couple of world records smashed. By the time 500m events started my state of nervous tension and receded to more manageable levels. Jonathan was first on again and doubled his rating [46? Are you sure? - Ed.] to put down a handsome 1:32. Then it was the Chesterton women’s trio turn. Everything was more familiar and, what with a full length warm up, I think we all felt much more together and got our a hat trick of PBs. I went sub 1:50 for the first time and Eleanor’s cracking 1:47 only missed the podium by a second. However, it was Anne who put the icing on the cake with a 1:56 that landed her convincingly in second place and lead us to another award ceremony to get her silver medal. We had to make a hasty retreat after that, so sadly missed the relay which featured five teams of women GB rowers, but we all had things to look forward to back in Cambridge. Our journey from Stratford International to Cambridge Central only took in 1 hour and 1 minute, which must be some kind of record. Anne went off to Senate house for a dose of long-ago-booked Handel’s messiah but Jonathan, Eleanor & Angela proceeded homeward to ready themselves for the Club’s Christmas party at the Pub where I re-joined them after an uplifting detour to see my son is his school production of Sister Act. All in all a highly memorable and, mostly, enjoyable day. With thanks to: My fellow BRICers, super supporter Angela, Captain Rachel’s BRIC countdown (and the title for this blog), the various messages of good luck and congrats and to those who posted photos of Team Chesterton dressed as baubles and the like on Facebook which were an excellent antidote to the more tense aspects of our experience! It was time. And what better preparation than moving down to Cornwall four weeks previously. However, no amount of practice on the Cam could have prepared for the feel of our (Andy's) little yellow boat on the dynamism of the Thames. Not even the outflow! Still, looking over the river wall in front of Sons of the Thames, the water piling up and breaking on the upstream edge of the pontoon, laid an extra layer of trepidation to the thought of setting off and what lay ahead. No cox, no stern four, no bow four. No bow pair, no stern pair, just bow (desperately trying to steer a ‘good line’) and stroke (providing the power, at well above a safe heart rate). But this was also a sad occasion. Probably my last row for the foreseeable future and I wanted it to be something to remember. Pushing off, the boat peeled away with the stream and we started the paddle up to the start. What a big river, and what had the navigation rules said? Cross at which buoy? Oh well. Do any of those look... yellow? What a sight as we moved past Chiswick Bridge and began marshalling. Swarms of us, normally such a rare breed. The Pair. Quite proud not to have received one, even polite, instruction from the marshals, we were in place and ready to turn in to the flow. One of the beauties of small boats is the camaraderie. We are all in the same boat, and yet not. A few good luck wishes and we pulled in to the stream and were lined up and ready to go. Winding it up under the bridge and, ‘number 69, Chesterton Rowing Club, GO!’ Good rhythm. 10 strokes, look. Where are we going? Where should we be going? What was that advice. Lots of subtlety about imagining a certain number of boats between you and which bank but basically, stay in the middle. So in the middle we stayed. Next bridge in sight. Line up. Look. Lined up. One last look. Back off Conor!! Not so close, but close enough from a very unforgiving bridge pier. Now through to what seemed more like a sea than a river. Where was that middle again? City, behind, where drifting back but Star had passed them and were bearing down on us. We should move over, but to where? They seemed more than capable of figuring out an overtaking move on their own. There went the pennant. Now relax, enjoy and push. My corner was past and now it was Conor's turn. Traffic seemed to be gathering ahead but shouts from the bank meant we knew where we were. Hammersmith bridge loomed ahead and our first overtake required some care, Putney Town, but the line seemed good. Then another bellow, this time from above, and it was time to wind up for the finish. Last 200m. Then last 10. Ignore the boats ahead, just go. Everything. The finish was there but when were we past it? Well, there was nothing left so we took it down. No relaxing in the pair though. Spin. Upstream, trying to keep it together to avoid being washed downriver, and then the sprint across the still racing traffic (over 500 boats!) to get back to the pontoon and safety. Why am I always surprised how draining this is. And I am sure that the ramp gets steeper on the way out (I know!). Beer and food and wait for the time, the position. 4 th in Club, worth it and a good end. Always could do better, and want to do better, but happy (and we beat most of the Cambridge boats!). Inspired by the Wee Folk, Chesterton RC had a plethora of boats rowing in the Robs' Autumn Small Boats Head in a number of different categories including a sculler, pair, numerous IVs and even a mixed quad! Top sculler Keith reports: fresh from the Great Ouse Marathon I took to the Cam to see how I mustered against the like of more than 20 university lightweights in my category. With competition like that, winning was a tall order. But it's a good opportunity to see how I compare! There was a strong headwind throughout and I went wide on both Grassy and Ditton. I ended up two minutes behind the leader. But I also managed to not place last, somehow finishing ahead of a UL. And given that last year I was slower than Robs' scullers (who happened to be juniors... and female) in my first SBH, I count this an achievement for my 2nd SBH. Infamous tall person Steven Andrews avers: a certain little yellow boat had been left fallow for over two weeks and was growing sad. Its crew, now separated by some hundreds of miles had started to become desperate for the water. Skiffs and ran dan and ergs were just not any replacement so the Rob Roy Small Boats Head was entered as a final training race before the trip to the big river, and to sate the crews thirst for the water. Stroke was feeling off colour but the little yellow boat was happy to be back out in the sun. After a few discussions at the start we slowly crept through the field in an attempt to not be held up during the race (always a tricky question to ask the crew in front, 'if they think they will be fast or slow', but it felt like we were winning already). Eventually it was our turn to wind up and we passed under the bridge feeling good, good rythm, swing, catch, swing, catch, so as to almost not notice the outflow. Corners came and went, as did the cheering fans (thanks Paul, thanks William), and then on to the reach. It wasn't meant to feel that hard, but it was the first head course in a while. And on reflection, we were pursuing a small flotilla, bunching up and passing a slower double. But the yellow hull kept on cutting through the churning water, reeling in the double, and then came the overtake which turned the straight line from railway bridge to finish in to anything but. Several poor steering moves later and a few clashes of blades and eventually blade and bow (and a bit of abuse from their bank party) we were past and dragging our tired bodies, in what is a lovely yellow boat, towards the line and, collapse. Not tidy, but gutsy and in fact beating all the IM1, 2 and 3 pairs (12 in total) and winning our plastic mugs (perhaps not the best prize on offer on Cam). 9th overall in a time of 11:14.4 could not be considered a bad days work. Next stop, the Thames. By Lorraine Turville: The Small Boats Head marks the beginning of the Winter Head season and sets up a good marker for improvement against for the rest of the season. We’d started rowing in our new coxless IV back in April and had progressed well, winning our first regatta at Peterborough in the Spring. Since then other rowing had taken priority. Rowing in Eights for Bumps and then spending time improving our sculling and entering a quad in the Great Ouse Marathon. So that combined with holidays we’d only just started to think about getting back in the IV-. A couple of outings were planned but unfortunately due to illness didn’t go ahead. Our entry was in but with no outings and two of the crew having rowed very little since July we weren’t sure whether to scratch. In the end we decide to go ahead and set a benchmark for the Head Season. Even though we’d not rowed together in the crew before the rowing came together quite nicely. In the end it wasn’t fast and probably not that pretty at times. Our time was 12 mins 22 secs To put that in perspective it’s equal to the time we’d set in the Small Boats Head last year when we’d raced as a coxed IV. And at Peterborough in the Spring our time was only 10 secs slower than our Men’s pair over 1000 m whereas we were 1 min 10 secs slower over the 2600 m Head course. It was a lovely day to be out on the river and served as a good reminder that to go fast you need fitness and water time! By Sarah Hadman-Back: moving into IVs the women's side had three boats competing in different categories. The IM3 crew (although Novice and moved up for competition) had little preparation but were excited to see how they fared against the competition of other boat clubs. Unfortunately, our preparation was hampered once more by our cox being taken ill and our Club Captain taking the reigns jumping out of a Mens boat into ours, thank you Simon! Marshalling was somewhat entertaining with our bank party having a few too many beers in his bike basket and having a tumble – he’s fine (we did check!) Unfortunately, our corners were hampered by a speedy men's junior double which decided not to give any space off the start pushing us wide on first post, and other men's crews chasing us down the reach caused a distracted race. However, with a time of 13 mins 5 seconds we were pleased with our achievement, we felt strong throughout and this was excellent preparation for Vets Fours Head. Also by Sarah: with some training under their belt our masters IV were ready for the race, however again injury struck and unfortunately Jo’s knee was not healed enough to race. A super sub (having just raced as well) was ready to jump into the 2 seat to support the Masters crew. After a somewhat long marshall after allowing the 20 lightweight scullers to come past, Anne decided we’d better just go before we wait even longer. Even with this long marshall, a perfect rhythm was set up my stern pair and our cox, Sarah, steered to perfection (her first race!) helping us secure a great benchmark time for the winter to come. By Steven "when shall we see his like again?" Andrews. A long long time ago in a distant galaxy a small yellow boat existed, just barely big enough to hold two men. It was discovered that with time and application this little yellow boat could be made to move with incredible speed . However there was one problem: it was almost impossible to control its direction of travel. At first its intrepid crew persevered with learning the corners on the sinuous Cam. Alas no success was found. Despite great speed, races were foiled by the ever strong draw of the bank. So it was that a straight line was sought to see if it might be possible. Although a daunting prospect it was in fact possible. Twice over the course was run and twice the yellow boat bobbed to the front. And so it was, back to the serpentine rivers we travelled. Sudbury: renowned for its corner, no one mentions the 'straight'. The corner was rowed, we were some distance in the lead, and then came the 'straight', and straight we went, in to the bank. Oxygen lacking, neither of the intrepid oarsmen could spark their brains in to life to co-ordinate escape. The opposition sailed by and despite a valiant sprint the little yellow boat was left lagging. But now rested and refreshed these oarsmen were back with their little yellow boat to the scene of where the bank had so cruelly intervened a year ago to the day. 99s regatta; 570m on the straightest bit of the cam. Now was time to make amends. The finest clubs in Cambridge formed the opposition (maybe the artistic licence has gone to far here as it was city and press) and for some reason we had been placed in the tier one competition. The sun broke through the as we sat on the start; was this a sign? And off we set (44 seemed a fair rating). Looking over my shoulder it seemed we were not gaining as fast as I had hoped (keep the rating high). Still we crept up. This was not the plan, we should have been past by now. Lungs were burning, legs dying and yet 50 ft to the finish came the call from the bank . It was close, oh so close.... two horns sounded. Ooooooo. Who? Just exhaustion. We had nabbed it. Two feet was the judgement. How could so much energy be stripped in just two minutes. How could we recover for the final? Tea and cake seemed the only answer. But 5 hours was a long wait. And the whole time our little yellow boat had to sit lonely on the oppositions trestles. With the wind swirling and the rain blowing across the meadow we urged our bodies onwards as we rowed up towards the start once more. The tea and cake had only done so much and I felt like this could need some deep reserves of energy. And then there was our opposition. The orange boat of press. There was history: Huntingdon, 99s regatta last year. We knew we, and our little yellow boat (Not as shiny as theirs but yellow), had the speed but there was the bank, always the bank. We were off, gaining well. Tiredness banished. Welcome support from the bank. We were up to them and edging past. But would the energy keep coming. We were clear now though. So just sit on it. But the energy. The bank. A call away from Conor and the river opened up the bank would not take us this time. And the finish!. Shattered. But nothing a pint in our new pots wouldn't cure. And now what for that little yellow boat? The Thames is calling. 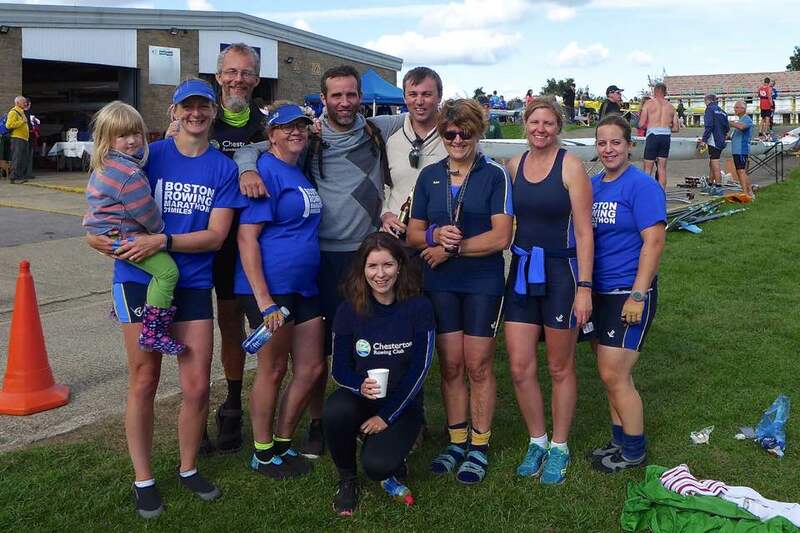 It’s become customary to wind off the rowing year with a crew undertaking to compete in the Boston Marathon, a 50 km row from Lincoln to Boston. The last couple of years (2015, 2016) we’ve stumbled upon a good formula of entering a mixed eight and although it’s still challenging to find 4 men and 4 women mad enough to race 50 km it does usually come together. 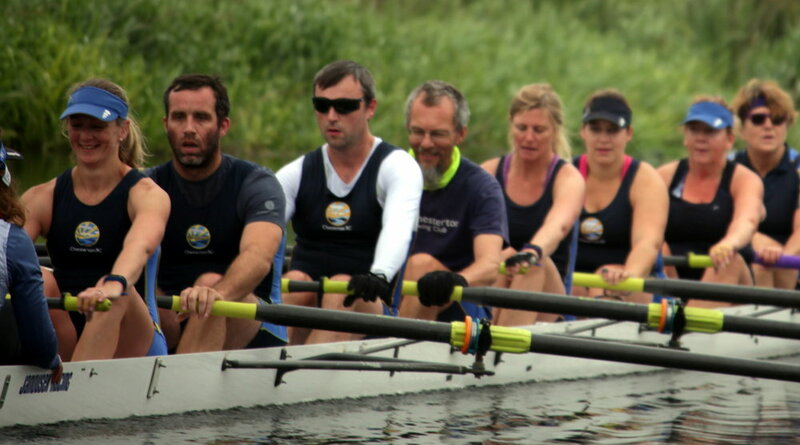 It’s a good idea to use the Great Ouse (half) marathon as training and 6 of the crew this year had indeed done that albeit in different crews, a mixed eight and a women’s quad. This year’s crew comprised of three men and five women and a few outings were cobbled together. Nothing too strenuous just a few outings to get used to rowing together, working out the most suitable rate for the crew, a practice “over-the-lock” and a one hour erg! The day of the race Sunday 17th September, the crew had an early start to get to the Lincoln Rowing Centre and it was mistier and colder than we’d expected. The boat was unloaded and put together, drinks and snacks discussed and arranged, bacon sandwiches and coffee consumed in the convenient café and important last loo trips made. Then it was time to boat. Once the boat was on the water, there little time to make adjustments, you’re called up to the start line with no room for a warm up and you’re off. A standing start for 50km is a little odd but necessary due to the lack of space for rolling starts. We set off at an optimistic pace, soon settling down into a rhythm. The sun came out and with little wind conditions were near perfect. We passed a couple of doubles before we reached the first major obstacle, Bardsey Lock at 13km. Our wonderful support crew had helped boats off the landing stage to make sure it was clear for us. We’d practiced interlocking the oars and “hand-bagging” it over the lock and so we managed to do this fairly efficiently, even though the banks are steep, grassy and slippery. The crew quickly got back in and pushed off and it was at this point we were passed by Olympian James Cracknell, who was competing in a single scull. We had our first stop for a drink and a snack just after the lock and then we were ready for the long stint to the finish. We were followed at times by our support crew, who drove down lanes to take pictures and shout encouragement. We had our second stop at just over half way (25km), this time in rolling sixes, a minute each pair so just enough time for a quick slurp and half a banana. Even with gloves blisters were now becoming sore but the refreshments gave us a second wind of strength and power and that combined with a men’s eight coming for us in the distance we took on a new pace, more pressure and a determination not to let them overtake. It was welcome change of pace having something to break up the monotony of the high-sided dyke. They did eventually overtake but we then had a second battle with a single sculler who had overtaken us but slowed down and we were ever so gradually able to grind him back down Our cox (Manja) was brilliant, motivating, encouraging and light-hearted even with very few hours sleep, we couldn’t have had a better person for the job. We seemed on target for 4 hours and to beat the current Mx Masters C8+ course record if we kept up the pace. At 12km to go we had our final break in rolling sixes and then we were ready for the final push for home geed on by our support crew cheering us on at Langrick Bridge. At 3km to go we took it up another notch to more like a head race pace. As we neared the finish our cox could see our local rivals the Nine’s Women’s Eight in the distance and we took up the pressure again, even though we had not much more to give, but we hung on and pushed as hard as we could. It was the longest 500m ever! Then we could hear the finish marshall, the horn sounded and that was it, it was over. Our bodies finally giving up as we crossed the line. The unofficial time was 4 hours 3 minutes. Very respectable. We spun the boat with great difficulty, hands hurting and bodies aching but thankfully our support crew were there to help us out onto dry land. Once safely on trestles we all took on the much needed food and drink of true athletes - pork pie, flapjack and beer! We all agreed that we had enjoyed it! And we’d bagged another course record confirmed at 4 hours 3 minutes beating the previous record of 4 hours 14 minutes. After t-shirts had been purchased “You need to row it to know” an improvement on the former “it’s long and hard” we hung around for a bit to see one of our crew from last year Valentina, pick up the trophy for fastest crew of the day, a mixed quad in a blistering 3 hours 19 minutes even beating the Olympian James Cracknell who finished in a time of 3 hours 31 minutes. Crew: Amanda, Steve O, Dan, William, Lorraine, Juliet, Angela, Anne; Manya. Photo credits: club members; James Hedges and Anne. There's a movie of us at the start, a movie of us at 47 km. And, for those interested, the start car park. * W3 down; W2 up; W1 up. * M3 row-over; M2 row-over; M1 down. * W3 spoons! W2 up 1; W1 level. * M3 down 1; M2 up 4; M1 down 2. M1 going down to Nines 2. Not a great triumph, but an interesting video. * M3: down; M2: up! M1: row-over. * W3: down; W2: up! W1: row-over. Cool drone video of W2 here. M1: a lovely evening. On the start line we have City 2 ahead of us again, and behind us we have Tabs 4 again. Tabs know how close they got to us yesterday, so are bound to go off hard. And they also know they have Nines 2 behind them, who bumped up, so that's another reason for Tabs to go off hard. For our part we know we can stay ahead of Tabs if we survive their charge, and resolve to push a little harder down FP reach. Today we have a better start than yesterday and Tabs get close, but not as close as yesterday. Around Grassy they put in a push but its really their last-gasp to avoid Nines, so when we push away they fall to Nines soon after and we can relax. Except! No-one tells Manya that there's no-one behind us so we race down the Reach; to be fair, it feels so bumpy that it seems City 2 must be close ahead, but I don't think they were. Tomorrow is fly-or-die; or perhaps some slightly politer version of that. * M1: row-over ahead (just!) of Tabs 3 (vid; bowcam) M2: up (pic; vid); M3: row-over (twice; pic). * W1: row-over (pic); W2 down (pic; drone video; bank video); W3: down. M1 heroically rowed over in the face of an impassioned charge from the boyz at Hillz Road, who closed to, errm, really rather close for comfort by First Post, and perhaps even less comfortable at Grassy, where they happily took a slightly sub-optimal corner whilst Manya took us round rather more tightly. With that breathing room, no breaking of our resolve, and fine support from the bank we held them at bay all the way down the Reach, finally clearing to nearly half a length by the Railway Bridge. Ahead of us Sharks didn't get Tabs 2; so it's same-again today. M3 (written from the video): it's a long way down to the lock and it feels very isolated. M2 set off back in fine style, with one whistle in 5 strokes, two in 10, three in 15 but then took all the way to 30 to close down Xpress 4. Well done boys, holding up the flag for the rest of us. * Nines 2 bumping Tabs 3 (once 2) coxcam. At last, it's here, the highlight of the Cambridge rowing year: bumps. All that energy, effort and training expended in one vast splurge of excitement, thrills, spills, accidents, random chance and well deserved rewards for endeavour. * M3 row-over (twice). M2: bumped Tabs 7 to head of Div 3 (vid), then City 8 to safely into Div 2. M1: down to City 2 (Sharks; vid). * W3 down to City 8. W2: row-over. W1: down to Tabs 3. Real time updates are of course to be found on Facebook. There's a drone video of W1.